I’m not a big cook. I like cooking and trying out new recipes, but I wouldn’t say I have a passion for making food. But I really like to watch cooking shows….a lot. In fact, I think I like to watch people cooking more than I like cooking myself! One of my favorite cooking shows is Master Chef. The premise of the show is a bunch of amateur chefs get together, are put through a variety of cooking challenges, and the chef who makes it through to the end is crowned Master Chef and awarded a bunch of money. My favorite challenge in the show is where each contestant is given a big basket of food and has to come up with an original recipe using only the ingredients in that basket. They don’t have to use all the ingredients; they can pick and choose those items that will work best for what they want to make. They also don’t know ahead of time which types of ingredients they will get, so they need to be prepared for anything. Even though each contestant is given the exact same ingredients, I’m always amazed at how different their final dishes turn out. Some chefs will make desserts, some breakfast foods, and others a gourmet entrée….all from the same basket. It’s easy to tell the difference between the mediocre chefs and the creative geniuses. The truly great ones go out of their way to combine foods in unusual ways. They take great risks and step totally outside the box. They take what they are given and turn it into something amazing. They also have to do some intense problem-solving and improvisation. When a main component of their dish falls on the floor, they have to quickly decide how to turn their remaining ingredients into a new dish. When they add too much spice into a dish and it tastes awful, they need to make a fast decision on how to make it great again. A few days ago, I ran across this great statement on Sara McGrath’s Facebook Page called The Unschooler’s Emporium. Exactly. It’s more like Master Chef. Just like Master Chef, parents of interest-led learners share the same basic “ingredients” or beliefs about how children learn best. We believe that children learn best when they follow their own interests and passions. We believe in lots of real world experiences, hands-on learning, and living a full, rich life. We also believe in respecting each child’s individual timetables for acquiring skills and do not use coercive tactics to “make” them learn. We each have community resources we can utilize, libraries we can frequent, and activities we can be involved with. But the way we combine those resources, they way we mix and match them together, will be different for each unschooling family. We may start off with shared beliefs and tools we can use, but each family, and even each child in each family, will create its own beautiful, deliciously wonderful flavor of learning. As parents we don’t know exactly what our kids will be interested in or need for the future. We can’t tell if their new interest in astronomy or dogs or architecture will last for a few weeks or a lifetime. We don’t know exactly what type of skills they might need to be successful in their chosen field when they’re 5, 10 or even 15. We can gather together a few “core ingredients”, like surrounding our children with lots of opportunities to read, play with numbers, learn more about the world, and by giving them lots of opportunities to take on responsibilities. But beyond that, we need to be flexible and willing to change. Just like the Master Chefs, if something is not working, we need to quickly do a course-correction and figure out with our kids how to make that change. As interest-led learning parents, we’re not interested in pursuing a traditional educational path. We’re bucking the mainstream; we’re taking risks. We’re approaching our lives with creativity and passion. And that takes a lot of hard work, dedication and originality – just like the Master Chefs. But I think the payoff is worth it in the end, don’t you? 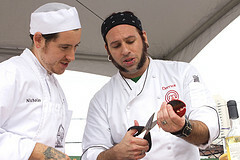 At our house, we watch Food Network all the time – especially the competition shows like Chopped, Iron Chef and others. We also like Storage kings, Pawn Shops, and all the other “reality shows” like the ones about alligators, crabs, lobsters, big families, little people… Survivor man, Man, Woman and Wild… I am terrible with the shows names as you can tell… but the DH loves them and so do the children. They watch, ask tons of questions and learn lots of stuff. My DD9 wants to work in an animal shelter, raise horses, be a Mom, homeschool her children, write books, paint and be an artist and sell her creations. God is good!!! Your blog is so inspiring. thank you for writing it… it has been a tool in God’s hand to speak to our hearts. thank you. Thank you so much for sharing this with me. That’s my hope- that God uses me to spread the message of how we can live and learn with our children in a peaceful, non-coersive environment. Your daughter sounds very creative! She’s very blessed to have you as her mom. I really like watching cooking shows, too! Actually, so do Jenna and Lauren. I like the comparison between an unschooling parent and a master chef…very good thinking Like you said below in reply to Karen, learning with our kids truly is a creative act, and I love it!! I totally agree, from one chef to another . . .
That’s a good analogy. I especially love what you said about intense improvisation and problem-solving. Thanks! I thought it fit really well with both cooking and interest-led learning. This is a great comparison. Love how we all take different things from the box and produce so many awesome results…all different, but all beautiful. You inspire me so much. Seriously…. Thank you so, so much for saying that! I just never really thought about how learning with our kids at home can be such a creative act.